My all time favorite bread has always been sourdough, preferably San Francisco Sourdough. I became curious recently about sourdough and the whole bread making process, so I started to research on the internet and found the basic sourdough is a simple process of allowing equal parts of flour and water to ferment. Flour naturally contains wild yeasts and bacteria spores. When mixed with water and left at room temperature the naturally-occurring enzymes break down the starch into complex sugars. The sugars convert into glucose and fructose that yeast can metabolize. The bacteria then feed on the metabolism products from the yeast. This process creates the sourdough starter. I tried creating my own starter and it did turn sour, but the loaf of bread was extremely dense and not at all what I was hoping to achieve. I wound up pitching it in the trash. 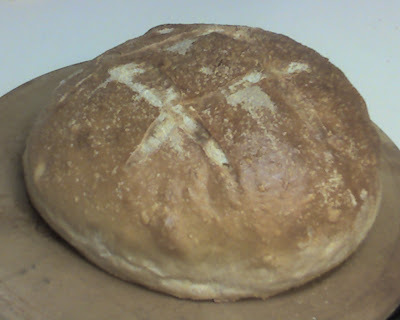 I really wanted something more along the lines of a true San Francisco sourdough, so I went back to the internet and discovered Linda Wilbourne's web site with a true San Francisco Sourdough Bread Starter. A little over a week ago, I purchased the San Francisco sour dough starter that is made up of a tiny amount of flour, the live wild yeast organisms, and another live organism called a lactobacillus, which is what creates the sour flavor in sourdough bread. I followed Linda's instructions to the letter to create my starter and the results are amazing. 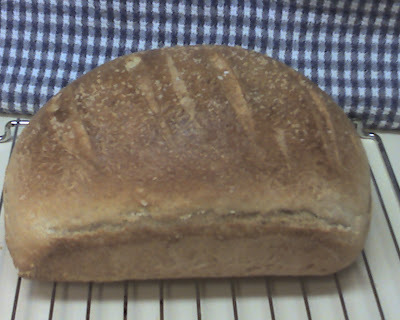 I spent 72 hours getting the starter to the point it was ready to be used to bake a loaf of bread. I didn't have much experience baking bread, but John does, so this past Monday, after John came home from work, he helped me with the first loaf. I needed to get a feel of how the dough should look and feel and John is a great teacher. Our first loaf came out of the oven about 12:30 AM (Tuesday morning). We let it cool for about 15 minutes before we sliced the first piece and had a taste. Oh my, this is really good stuff! That same Tuesday, after a little sleep, I went about the process of creating more starter and I made two more loaves, you know, just to get some practice in. One was a round of white and the other a sandwich loaf using 1/2 white and 1/2 whole wheat flours. Both were absolutely delicious! I now have a couple of sourdough starters safely stored in the fridge. The starter "stash" needs to be fed about once a month to keep the population of hungry micro organisms alive. It's pretty easy to do and this will give me a never ending supply of sourdough yeast for baking.